How Do You Simplify An Expression With Negative Exponents? This tutorial shows you how to fully simplify an expression and write the answer without using negative exponents. Follow along and see how you can use the quotient of powers rule to help! Triangles, monomials, and ratios, oh my! Don't worry. It's easier than you think! 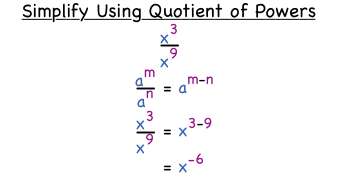 Watch this tutorial to learn about dividing monomials. Dividing monomials? The quotient of powers rule can help! Learn how divide monomials in this tutorial.